Longtime readers will know that The Hubby and I love cooking and having people over, and over the years, we've collected several go-to recipes that we can pretty much do with our eyes closed, and still please (most of) our guests' palates. 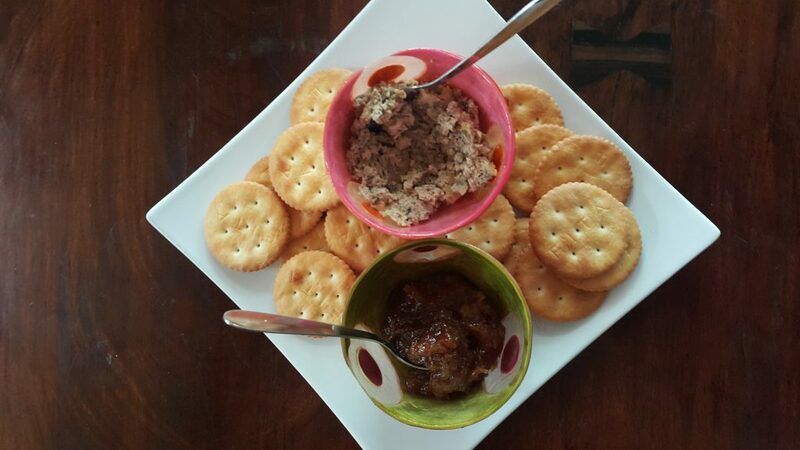 This super easy chicken liver pate is one of those recipes, and even avowed liver haters seem to like it. I haven't made this pate in some time, and I decided to dust off the recipe and serve it for my birthday celebration a few weeks ago. It sure jazzes up plain Fita crackers! I also served it with one of our experimental HP Dirt Pile Farm caramel banana jams--makes a nice contrast to the pate's savory flavor. Dress up your appetizers by using pretty capiz bowls. I got this recipe years ago from Casa Veneracion, but I can't seem to find it on her new website (she does have a newer pate recipe). I love her recipes! Relatively easy, local ingredients, and delish! Bring the livers to boil in about two cups of water. Simmer, covered, for about 10 minutes. Drain the livers, and cool. If you haven't removed the hearts and membranes, now would be a good time to do so or forever hold your peace. Melt the butter in a pan and saute the onions and garlic until translucent. Turn off the heat. Add the butter mixture to the pureed liver. Add the remaining ingredients. Mix well. Tweak the seasoning as needed. Spoon the mixture into ramekins. Put the ramekins into a baking dish with sides higher than your ramekins. Pour boiling water (very carefully!) into the baking dish (don't get water on the pate! ), up to three-fourths of the ramekins' height. Bake in an oven preheated to 375F for 20 to 30 minutes. I don't have ramekins, so I use smaller oven-proof baking dishes inside my bigger baking dish. I guess you could skip the baking part (because I ate the pate before it was baked, and it was fine), but the baking is worth it. You could even use a toaster oven, in a pinch. I use a stick blender for pureeing, or if I'm feeling too lazy to wash, I use a fork to mash. Note that mashing with a fork will not give you a very smooth texture, but I sometimes can live with that. If you want to really impress, go for the machines. This keeps quite well in the ref, covered. You can eat it cold, or bring it to room temp. But I love it fresh out of the oven. This works with crackers, even bread! Lately, I've served it with a caramelized banana jam (more on that in a future post) and it's divine.